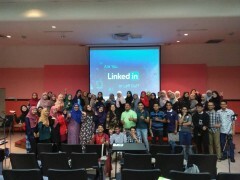 It was a very interesting topic and we are glad to have had Miss Anis Azman, Employer Branding and Talent Acquisition from OCBC Bank.The topic focused on personal branding through Linkedin and how its importance in eyes of recruiters. The two hours slot was so interesting as students really took opportunities to ask questions pertaining to self branding and some other concerns with regard to recruitment. The speaker reminded all students to establish unique proposition which could make them stand out among other graduates.